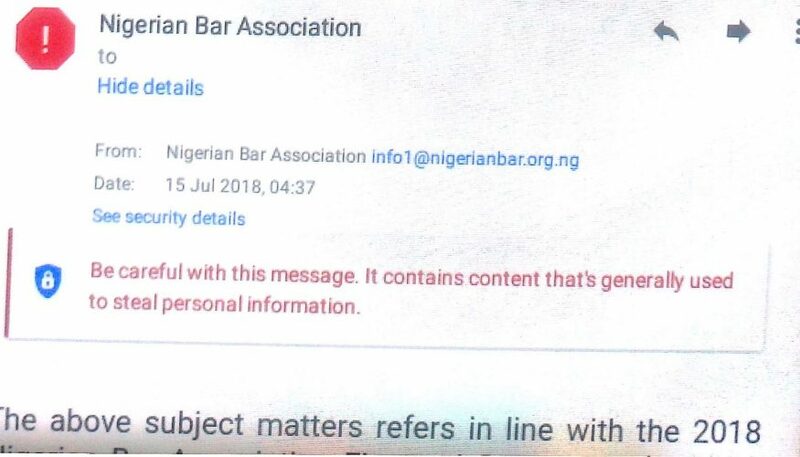 The controversies trailing the forthcoming Nigerian Bar Association (NBA) National Officers Elections inched up a notch higher at the weekend due to a phishing email to members allegedly emanating from the lawyers’ body. This is coming against the backdrop of an exclusive report by CITY LAWYER http://citylawyermag.com/2018/07/12/nba-hires-usoros-co-directors-firm-as-ict-partner-for-elections/ which showed that Mr. Paul Usoro SAN, a major candidate in the elections, is a co-director at Access Bank Plc with Dr. (Mrs.) Ajoritsedere Josephine Awosika, the first female Chairman of CHAMS Plc. CHAMS has been selected by the NBA as the ICT Partner for the crucial elections. The association had on July 11, 2018 sent an email to all members announcing the commencement of the verification exercise scheduled to hold between July 10 and 15, 2018. Signed by the Electoral Committee of the NBA (ECNBA) Secretary, Mr. Bolaji Agoro, the email urged members to visit the election update portal to participate in the exercise. When the July 15 email was viewed with another computer system, a similar warning was generated as follows: “This message seems dangerous. Many people marked similar messages as phishing scams, so this might contain unsafe content. Avoid clicking links, downloading attachments, or replying with personal information.” It is noteworthy that the verification portal addresses provided in both emails remain unchanged at https://nbaelectionprofileupdate.com.ng/. It is noteworthy that when a computer cursor is placed on the name of the sender of a phishing email, the fake email is revealed. However, when this tool was applied on both emails, it still indicated that both emanated from the NBA and its regular email address. This has raised serious concerns on whether the verification portal has been compromised. It also raises issues as to the source of the suspicious email and the capacity of CHAMS to secure the voting portal from hackers and deliver an election that is devoid of rancour. Given the hiccups that have attended the verification exercise, there are strong indications that many lawyers may not be able to participate in the exercise. NBA President, Mr. Abubakar Mahmoud SAN had severally promised to deliver free, fair and rancour-free elections come July 27 and 28, 2018. It is recalled that the 2016 NBA Elections was marred by controversies that threatened to tear the lawyers’ body apart. in the mess it is, partly because of Election rigging. I therefore call on all lawyers to resist CHAMS and the NBA National Executive (of which I am part) because of the incalculable harm they about to unleash on the NBA. It could even lead to the disintegration of the NBA and the formation of a splinter body as some Lawyers are threatening. Those concerned should please listen to wise counsel. Paul, please be assured that if hearken to this unbiased and patriotic advice, when next it is the turn of your zone, I will champion your cause and will vote for you. Elder Oyibo Chukwu. Chairman, NBA Oji River Branch.